You might be familiar with places such as Munnar, Kozhikode, Kovalam and Thiruvananthapuram in Kerala. The most popular destinations in this God's own country! But have you visited Kottayam - the land of lakes, letters and latex yet? Kottayam is a beautiful city located in the state of Kerala, and is at a distance of about 150 km from the state's capital Thiruvananthapuram or Trivandrum. During the rule of British, it was known as "Cotym". Kottayam used to be one of the important centres of literature, and it is reflected in the initiation of many popular newspapers such as Malayala Manorama, Mangalam, etc. The city is acclaimed as the land of lakes, letters and latex since it was the first ever completely literate city of India and is a hub of rubber and spice trade. It is nestled between the majestic Western Ghats and backwaters making it the perfect centre to visit both, the mountains and the lagoons. Since Kottayam has tropical weather conditions with hot and humid climate throughout the year, the best time to visit is between September to February. Relatively, the climate is cooler and will be the perfect time to explore. In 2013, Kottayam turned into the nation's first mural city, with murals decorating walls of many buildings in the region. Almost 300 artists from all across India, worked alongside the artists of Kerala to turn it into a canvas of mural painting throughout the city! The spotlight, however, is the Pushpagiri Church in Thellakom town, where the artists joined to create a 300 ft painting of the Noah's Ark. Walls of many other places such as temples, public places, churches and libraries were splashed with colours. Here are the places to visit in and around Kottayam. One of the popular tourist sites in Kottayam is the St. Mary's Orthodox Church, also locally known as Kottayam Cheriyapally which is located just 2 km from the city centre. Built in 1579, it is one of the oldest Orthodox churches in India. This is a well-preserved church, where one can see a blend of Portuguese and Kerala style of architecture comprising a number of galleries, pediments and pillars. The Juma Masjid located in Thazhathangadi in Kottayam is settled on the banks of river Meenachil. This Juma Masjid is believed to be over a 1000 years old. The beauty of this ancient and regal mosque is reflected in its intricately carved wood designs and its architecture on the whole. It is believed that the Muslims who lived here had an active role in the Indian freedom struggle. However, like many mosques, only men are allowed inside this Juma Masjid. Located 16 km from the main city of Kottayam, Kumarakom backwaters is a popular tourist destination, with the background of Vembanad Lake which is the largest freshwater lake of Kerala. Many man-made islands are grouped to form Kumarakom. 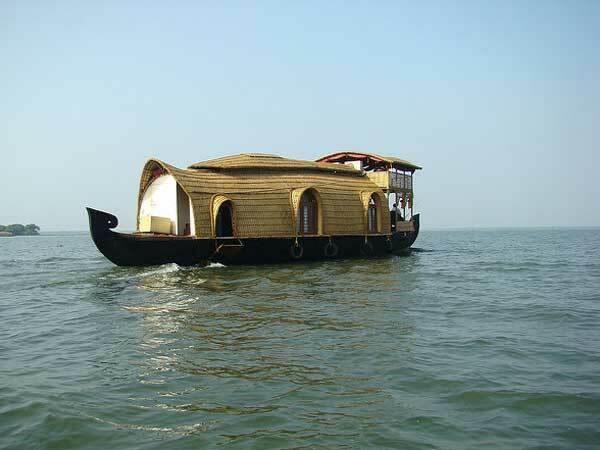 Houseboats are available on the backwaters which can be rented. The tranquil experience of being here will make you never want to leave Kerala! Residing parallel to the Arabian Sea, the Kerala backwaters are a group of brackish lagoons formed due to the waves and currents from the rivers flowing from the Western Ghats. The Kumarakom backwaters are home to a bird sanctuary that spreads across an area of 56,000 sq m. This beautiful sanctuary is set amidst lush greenery, a paradise for both nature lovers and bird-watching enthusiasts. It attracts birds from places like the Himalayas and some even fly from Siberia! Birds like Siberian Stork, Egret, Waterfowl, Teal, Darter, etc., can be seen in the sanctuary. Pathiramanal is a beautiful island located on the lake, which can be reached by a motorboat or house-boat. Cruise to this small blissful island to have a brilliant bird-watching experience. Located around 11 km from the main city, the Panachikkadu Temple which is also known as the "Mookambika of South" or Dakshina Mookambika, is a temple dedicated to Goddess Saraswati. Vishnu, Ganapathi, Shiva and Yakshi gods are the sub-deities worshipped here. The neighbouring villages of Nattakom and Panachikkadu are fringed with beautiful evergreen forests. Recreational activities and Kerala's famous Ayurvedic massage centres can be found here. Vaikom is a quaint town located about 33 km from the city of Kottayam. The town is well-known for the role it played during the Indian freedom struggle, by hosting the Vaikom Satyagraha. The town's famous attraction is the Vaikom Shiva Temple, which was built in 1594 making it one of the oldest temples of Kerala. The routine pooja hasn't been broken in this temple since its birth. The Vaikom Shiva Temple along with Kaduthuruthy and Ettumanoor Mahadeva temples form a trisome which, devotees believe when visited all at once,will fulfil theirwishes.. Sometimes known as Ilaveezha Poonchira, this is a valley surrounded by three hills, namely, Thonippara, Mankunnu and Kodayathoormala. It is a relatively off-beat destination, perfect for a weekend picnic and is just about an hour's journey from Kottayam. The major tourist attraction here is a viewpoint located at an altitude of 3,200 ft; it is surrounded with green natural beauty and offers a scenic view of the three hills. It also is a popular spot among trekkers, who begin their trek from the town of Kanjir which is located about 7 km from the top. Marmala Waterfalls is located in Kottayam district around 50 km from the city. This beautiful waterfall can only be reached by travelling in a jeep due to its rough and rocky terrain. However, the sight of this peaceful waterfall will be worth the efforts. It falls from a height of around 200 ft and merges with the River Teekoy. Beautiful forests of rubber trees can be found around the waterfall.